Just a quick note to tell you how much your puppy loves it here. She is absolutely bonded to the Pyrenees, Homer, and never leaves his side. She also loves hanging with the horses and following the chickens around. 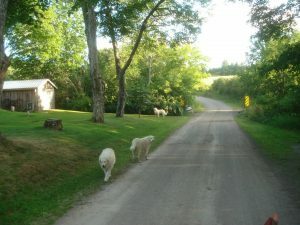 We go for accompanied walks around the fields and woods and she & Homer sometimes take off on their own for awhile but are now trained to come back at the sound of an air horn and whistles. I don’t like them roaming on their own because there are trappers in our area with coyote snares out. Thank you again for such a lovely little girl. I would have loved to have been with you at the Kuvasz World Meeting and to have the opportunity to visit the various breeders’ facilities in Europe. I truly love this dog. Our two Kuvies are doing very well and Esther has FINALLY stopped trying to ‘help’ with the chickens. She would never hurt one but somehow thought that she had to round them up at times, including picking them up gently by their tail feathers and sticking them to the ground with her snout. She never bit or shook them but would have a good ol’ time if they tried to run away from her – it was ‘game on’ for her. However, incessant vigilance and consistent response (& maturity on her part) finally proved successful in getting her to stop that behaviour and now she simply watches over them throughout the day. 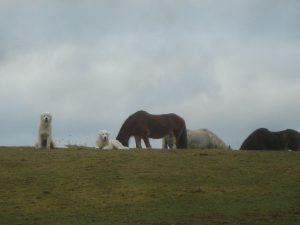 She also feels that the draft horses needed guarding and loves to spend time in the pasture lying down and surveying her wards. When they start to run she and the Pyrenees will chase after them and bark and play and I’m amazed that they haven’t gotten kicked or trampled yet but they always manage to stay JUST far enough away to avoid injury (for now). to keep us company in our declining years. I haven’t had any communication with Agnes for several months now and will check in on her later today to see how she and her two dogs are doing. I know that her dog (Esther’s sibling) also had a propensity to molest her hens. For a while we called our dog Esther the Molester. However, she’s absolutely perfect now other than her car-chasing behaviour. Although we are very remote we do get vehicles on our road at times, especially now during hunting season, and she and the Pyrenees will hear the vehicles coming from 1 km away and lay in wait for them at the end of the driveway and then chase them away from our property.. She is relentless despite my shouting ‘NO’ at her and calling ‘bad dog’. I know that she thinks that she’s helping to keep our property stranger-free but I don’t want her getting hurt. Hopefully she’ll grow out of that behaviour as well. My other Kuvies never chased vehicles – go figure.